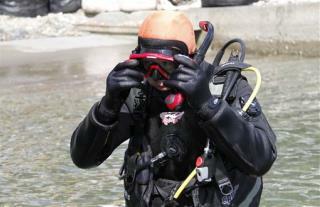 (Newser) – On a chilly morning last weekend, a 57-year-old Japanese man adjusted his diving mask before heading out to sea from the tsunami-hit northeast coast, but he wasn't doing it for fun: Yasuo Takamatsu is learning to scuba dive in hopes of finding the remains of his wife. As Japan marks the third anniversary of the 2011 tsunami today, 2,636 people remain missing, their bodies presumably swept out to sea. Takamatsu's wife, Yuko, was at her office when the magnitude 9.0 earthquake that spawned the tsunami struck offshore at 2:46pm. At 3:21pm, she sent him an email: "Are you OK? I want to go home." That was the last time he heard from her. She was 47 when she died, and left a now 23-year-old son and 20-year-old daughter. kinda cool . he'll never find her but there may be peace in the waves for him. Great story but I don't think he will ever find her.